Charles Todd has found his Royal Enfield Indian Chief. He wrote me, in December, asking if I would place a "Wanted" ad on this blog, seeking a Chief, at a reasonable price, that he could have shipped to him in Australia. As it turned out, he found the motorcycle he wanted right here in my home state, Florida. 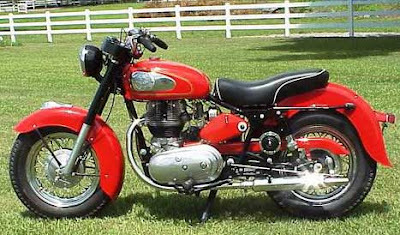 It is a lovely red 1960 machine. It was advertised on the Walneck's Classic Cycle web site, at an asking price of $7,500. The contact didn't come through this blog, but putting out the word helped. It was one of those "somebody who knew somebody" connections that so often works out in life. Congratulations, Charles. Please update us on your experience when the motorcycle reaches you.